Christina is one of my students and this is her review. At the end of her review she asked me if I would read this book. Up until now I would have said no. The reason? 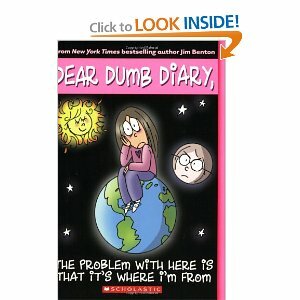 I've read many review of the Dear Dumb Diary books and none of them sparked my interest. The way she presented this one did and yes. I have read it. Jamie Kelly is a girl who writes a diary about what she's been through. In this book she wants to be foreign. She likes the different cultures. She has a best friend Isabella who goes through every crisis with Jamie. Jamie's Aunt Cara is getting married with Angeline's Uncle Devon which is the assistant principal so now Jamie is really mad because she doesn't want to be cousins with Angeline. Jamie hates being normal. She wants to feel how it is when you are foreign. This is a really good book because it talks about what middle schoolers go through. I would recommend this book to everyone I know because this book is awesome. I can connect to this book because I would like to be in some one else's shoes. I am very curious about other people's lifestyles.